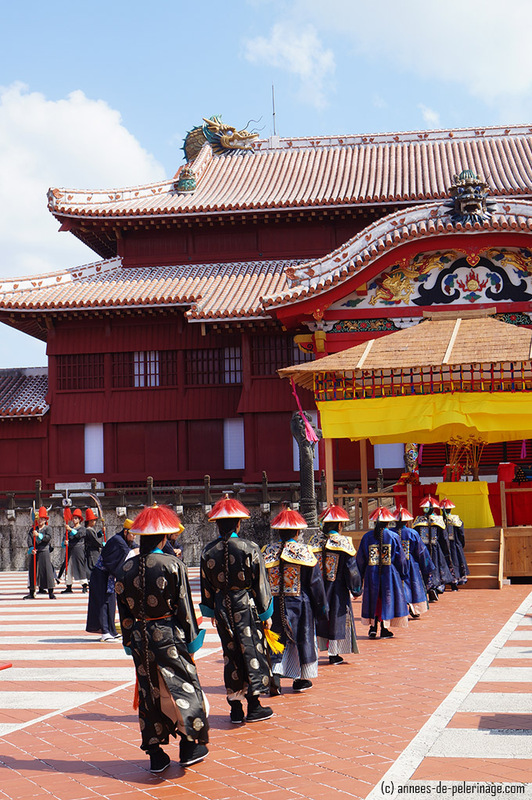 Reviving Japan’s many faceted past with authentic costumes, parades, and dance at Shuri Castle. 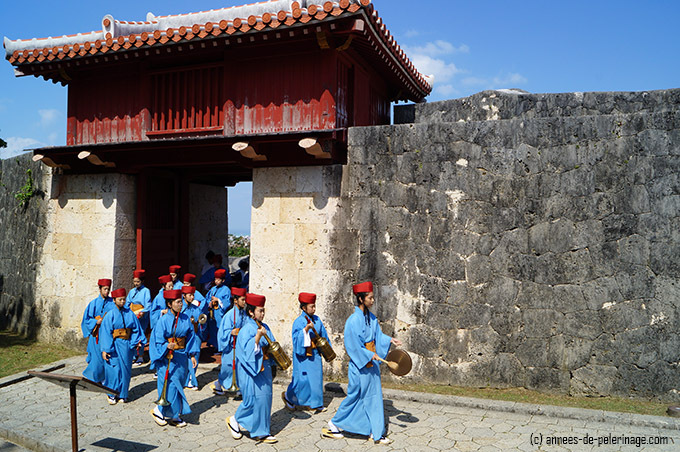 Shuri Castle in Naha, Okinawa is a place where history truly lives. Yet that fact is a miracle in itself. What was once the palace of the Ryūkyū Kingdom, burned down almost completely during the Battle of Okinawa in 1945. Since the End of World War II immense efforts have been made to reconstruct the UNESCO World Heritage site. But the Okinawans took reconstruction one step further! Every year on the last weekend in October a special ceremony is held in honor of their illustrious past: The Shuri Castle Festival (首里城祭). There and then thousands of actors recreate the enthronement ceremony of their very first King – authentic costumes and music included. Never heard of that one? 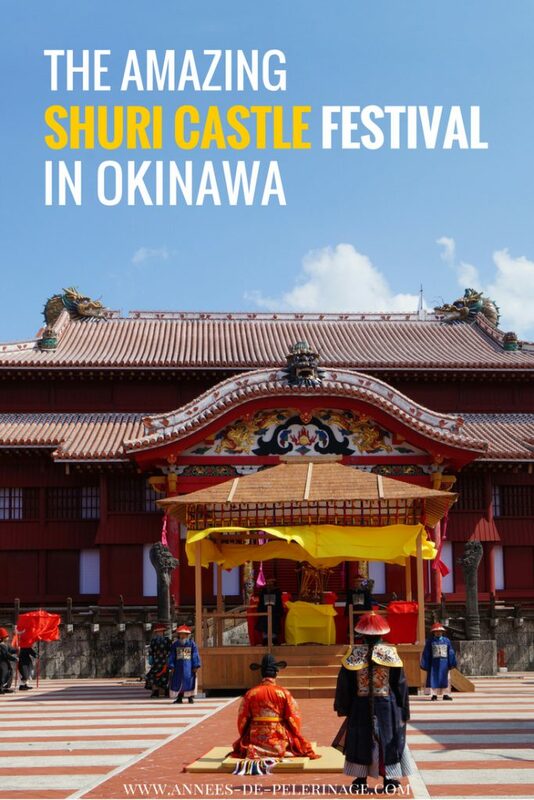 I want to be honest with you: I haven’t heard of the Shuri Castle Festival before my first visit to Okinawa either. Okinawa is not exactly an international tourist hotspot – not even for people doing luxury travel like me. Information about the island and its customs are quite scarce – at least if you want to read them in English. 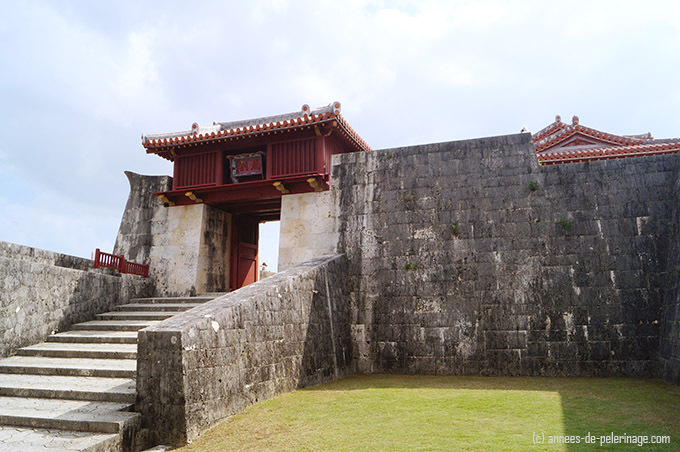 I only knew I wanted to visit Shuri Castle but little of what awaited me there. So I have to thank the gods of fortune (as well as my mom, MTV, Sony records and Chuck Norris) that on the day I scheduled my visit, I literally walked right into this unique festival. 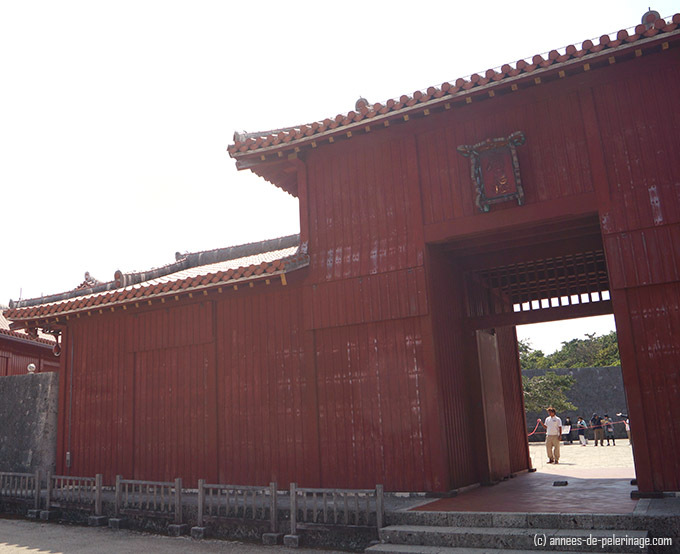 Shuri Castle is located on a scenic hill overlooking Naha city. A series of gates lead on a slight, stepped incline to the crimson main hall. Stone walls, seamlessly cast from monumental limestone building blocks, might remind you of an Asian version of Machu Picchu. Funnily enough, the castle’s origins date back to the 14th century as well – though no connection exists. Can you imagine my surprise that, when I was about to walk through that final timber gate onto the palace grounds, I heard faint music wafting through the air. Strings and drums played along to unfamiliar rhythms and melodies. At first, I suspected some kind of ingenious loudspeaker system responsible for the acoustic interlude. Rope barriers had been erected all around – a detail I must have associated with conservative measures – for even then little did I expect what awaited me around the corner! Behind the gate was located a small courtyard where a little stage had been rebuilt. On that stage my surprised eyes spotted two dancers, their fans held up high in the air, shuffling around with measured steps. A band, partially hidden in shadows, accompanied their perfectly synchronous play with an alien beat. Standing in a huge throng of people, some of them having waited long enough to occupy the rarefied seats under a makeshift pavilion, I watched how one traditional dance was performed after another. 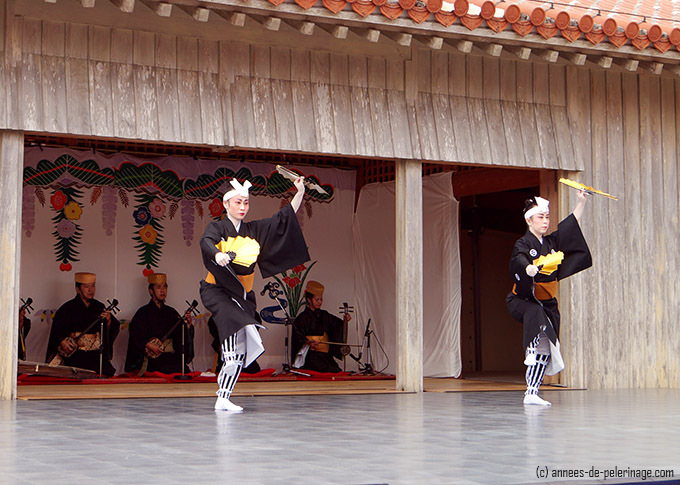 Not looping, not jumping, but more a sinuous bending and perfectly smooth transitions, different dancers showcased the many facets of Okinawan performing arts with bright costumes and surprisingly versatile music. More than intrigued I asked one of the many guides standing around what this was all about. And here I was surprised again: An English speaking volunteer was directed to me (and there I thought I could practice my Japanese!). From him, I learned that these outstanding dance performances marked but the begging of a day-long festival – the Shuri Castle Festival. With a schedule of the proceedings in one hand, I moved down again to the entrance of the Shuri Castle. Now obviously that’s nothing I would normally do. In 30 minutes, however, the Parade of the Vassals was to take place and I wanted to look for the perfect spot to take my pictures (you tell me if I succeeded down in the comments, deal?). You have to understand that China was the political, cultural and military center of the Asian continent and beyond. An emissary of the Ming Emperor was in fact way more important than the struggling first King of Okinawa. The parade was to honor their importance and, conveniently, by honoring their status bequeathed that status on the King of Ryukyu by implication. To some degree, the whole ceremony also wanted to copy the Chinese enthronement ceremony. 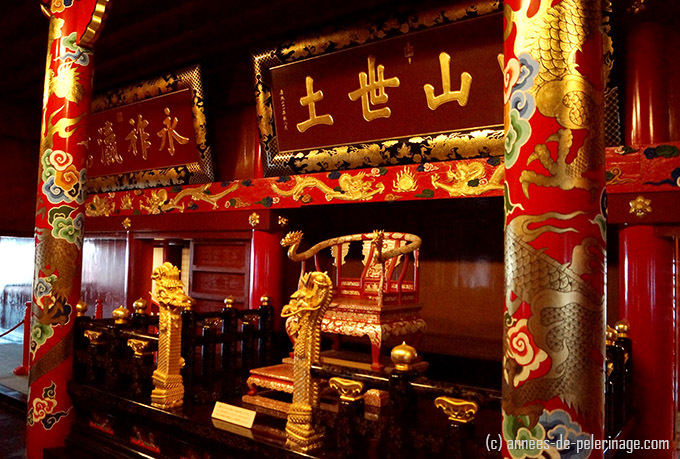 Now Shuri castle is certainly not the Forbidden City (Read my article on the Forbidden City to compare the two – quite an interesting thing to do in fact!) 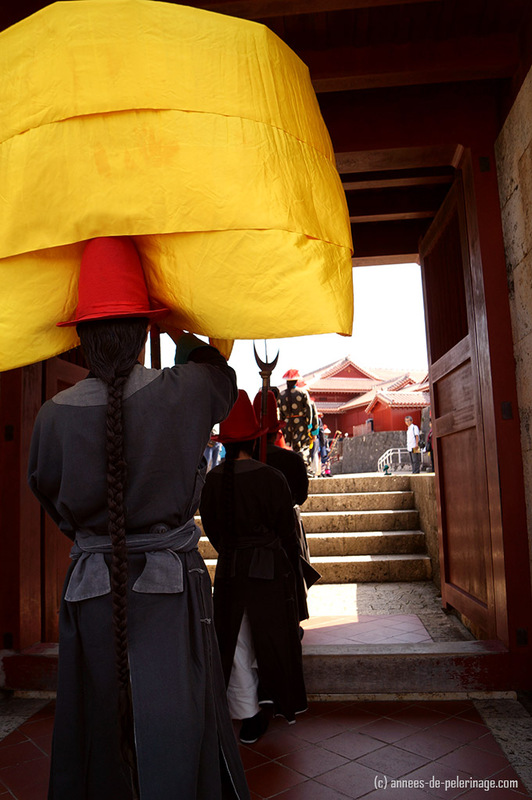 but the ceremony will give you a very first impression of what Chinese court ceremonies were like. Since the Chinese government hasn’t really shown any interest in reviving that part yet, quite a unique experience. It wouldn’t be called a parade, though, if only the emissaries themselves partook. A whole range of musicians, guardians, and whatnot preceded the official envoys of the Ming emperor – all glad in vibrant silks. Despite the fact that the whole procession these days consists of volunteers, they really did a good job. 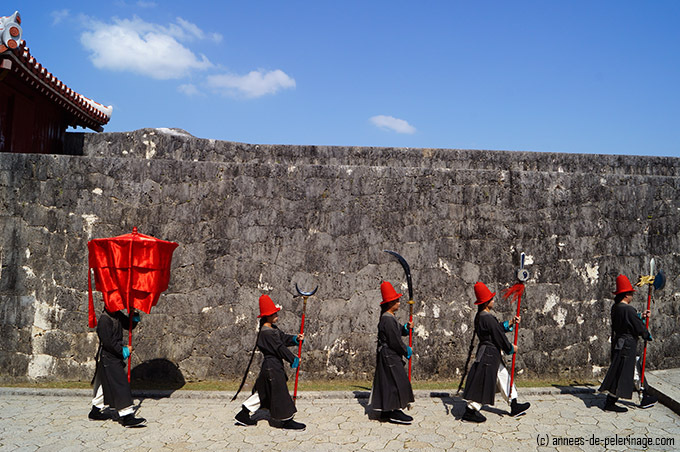 It’s not like you really feel taken back in time, but the impression you get at the Shuri Castle Festival is solid nonetheless. 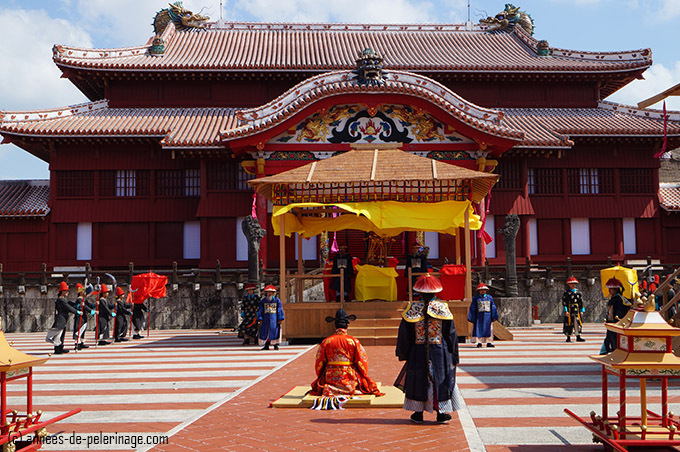 After the parade, the Shuri Castle Festival will sadly take a break of 30 minutes. Sadly, because instead of the Chinese emissaries directly walking into the central courtyard they vanish to the sides to take a break. Also, it is worth taking a note that until now all you saw was free. No ticket is needed for the approach to Shuri Castle. The actual enthronement ceremony takes places in the inner courtyard of the palace. A small fee of 820 Yen is needed (though no extra for the festival) to get in. Makeshift pavilions have been erected here to conduct the ceremony. The brand new look of them looks somewhat disturbing. But to be fair: Back in 1404 these structures probably looked no different and were in equally pristine condition. The ceremony starts where the parade ended – all the actors will slowly file into the courtyard. Finally, then the Chinese emissaries will end their solemn march here as well and take their honorary seats (what you see above in the middle of the cushion is the King himself). All this is accompanied by a host of musicians that sit on the sidelines of the courtyard. The atmosphere they create is just as authentic as it must have been 600 years ago. Sadly a Japanese narrator disturbs the whole proceedings with his comments. But maybe this is all good because what follows is a sheer endless number of rituals. Opening certain holy scrolls, placing seals and transferring gifts, the meaning of them all will be lost to you despite the dubbing. The soon to be King of Ryukyu changes positions all the time. Once he is sitting on the central axis on a special cushion, then he walks to the altar, picks up a scroll here and there and goes back to his cushion. The emissaries will shuffle around frequently as well. 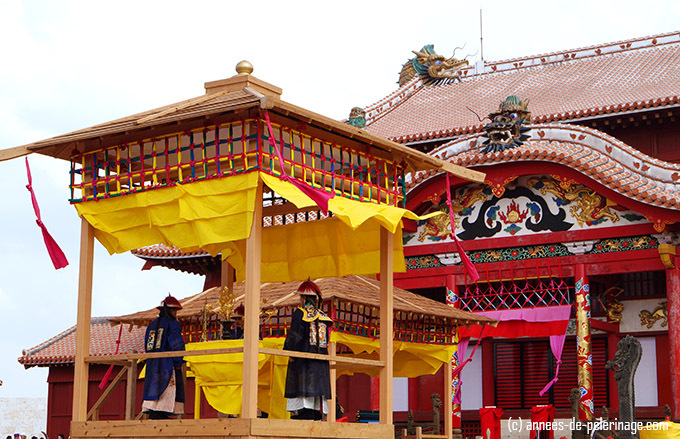 The colors of the alien ritual brought to the stage during Shuri Castle Festival will take your breath away. The length of it will probably tax your patience. That, too, has to be seen in its history context, though. The enthronement ceremony of the Ming emperors had been lengthy as well, to say the least. In fact, his daily rituals will have taken longer than the 2 hours of this play. So it all boils down to believe – if you believe the placing of a certain seal on a scroll passes down the will and holy benediction of an almighty emperor, then and there the ritual would start to be more than interesting. This belief, however, is very hard to grasp for a modern westerner like me. After the ritual is finally concluded I took some time to tour the inner corridors of Shuri Castle. Here the throne of the Ryukyuan king is on exhibition. Be aware that nothing of what you will see will be more than 50 years old. Everything has been reconstructed starting from 1958 (excepting the foundations). Many tourists might find this fact bothersome. In Europe, millions are invested to preserve a rusty nail. Asia, especially Japan, has ever been different. Take for example the main shrine of the Shinto believe in Ise. It’s a unique historic site but every 20 years the whole thing is reconstructed from scrap. That way you don’t preserve the actual structure but rather the skills needed to do so. The Shuri Castle Festival adds to this mindset on another level. While the ceremony itself might present them without an inner value – the music and dance that come along with it are an important culture Heritage that gets preserved that way. Same can be said about the costumes and language – they too do their part to preserve an essential heritage throughout the ages. It honestly makes me wish that this mindset would be more present here in Europe. Even though this thought is a profound one, I do not want to leave you here pondering about western materialism. 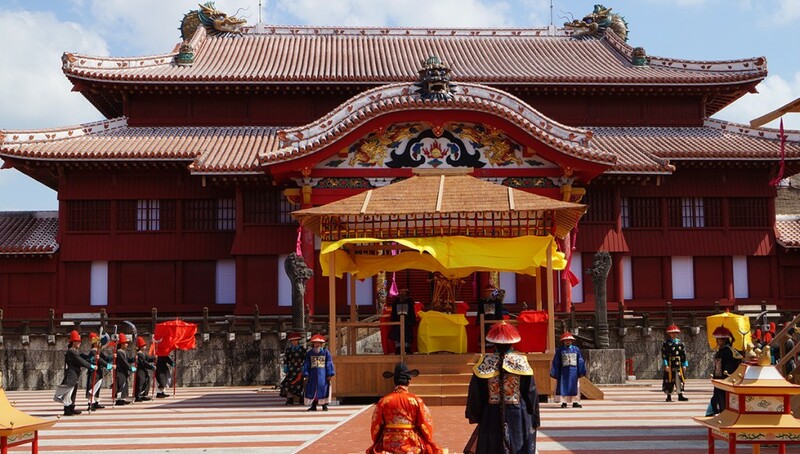 Instead, I’ll cheer things up with a video of the Shuri Castle Festival. Enjoy. Above you can see the Stone Gate of Sonohyan-utaki. That’s a sacred groove inside Shuri Castle and about the only part of the castle that didn’t get totally destroyed in the last conflagration. That being said the Okinawans are trying very, very hard to get their history back. Of course, you will notice the difference. It’s not the real deal. However, the reconstructions have only been finished in 1992. I am more than positive that the whole castle will acquire a nice patina in the years to come. 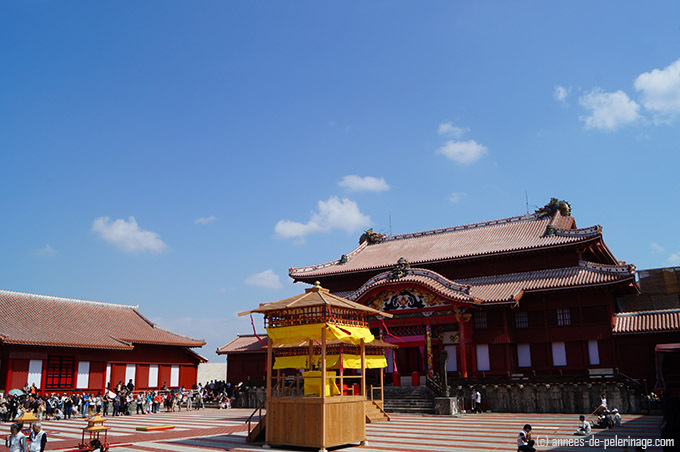 Shuri Castle Festival, held on the last Weekend of October, sure adds a major reason to visit the place. 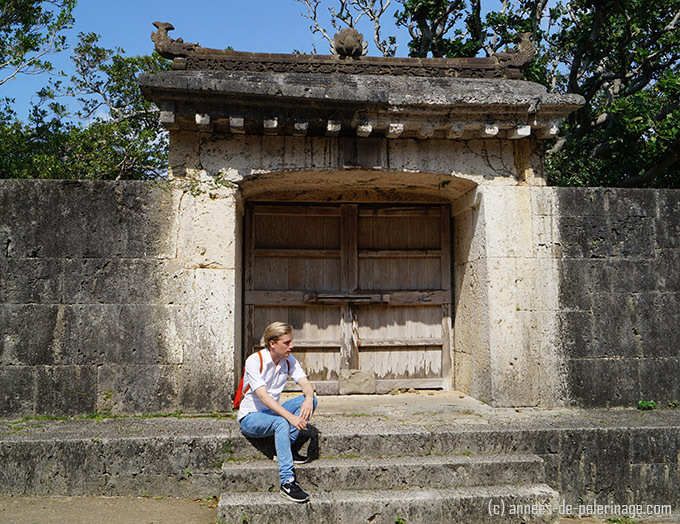 If you want to know what else to do in former Ryukyu kingdom – check out my guide of 10 exciting things to do in Okinawa.